Martin York leather and brass pleasure driving harness, gig pad back band. In like new condition, made to fit warmblood size horses. 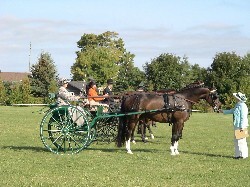 Was used on a 16:1 hand Dutch Harness gelding at the smaller adjustment size.